Extensively hydrolyzed protein for easy digestion and absorption. Lutein and DHA for developing eyes and brain. Once enteral feeding is well established, Similac Human Milk Fortifier Hydrolyzed Protein Concentrated Liquid can be added to human milk. * One packet mixed with 25 mL of human milk. 1 Kim JH, et al. J Pediatr Gastroenterol Nutr 2015;61-665-671. 2 Klein CJ. J Nutr 2002;132(6):1395S-1577S. 3 Agostoni C, et al. J Pediatr Gastroenterol Nutr 2010;58:85-91. 4 Centers for Disease Control and Prevention. Enterobacter sakazakii infections associated with the use of powdered infant formula—Tennessee, 2001. Available at http://www.cdc.gov/mmwr/preview/mmwrhtml/mm5114a1.htm. Accessed March 10, 2016. 5 Pediatric Nutrition Practice Group, Robbins ST, Myers R. Infant Feedings: Guidelines for Preparation of Formula and Breastmilk in Health Care Facilities. ed 2. Chicago: American Dietetic Association, 2011. Add contents to human milk; shake until mixed well. Once bottle feeding begins, use within one hour or discard. Keep unopened packets at room temperature in this protective carton; avoid extreme temperatures. 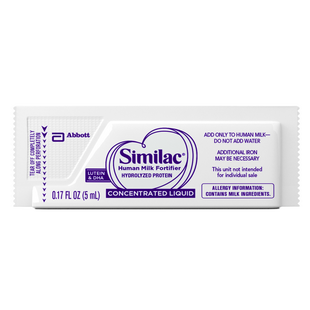 * One packet (5 mL) Similac Human Milk Fortifier Concentrated Liquid in 25 mL preterm human millk. Preterm human milk values from "Meeting the Special Needs of Low-Birth-Weight and Premature Infants in the Hospital." Columbus, OH: Abbott Nutrition, Abbott Laboratories, Jan 1998, p 56. * Per 100 Calories, as fed, approximately 4 packets in 100 mL preterm human milk (24 Cal/fl oz). Preterm human milk values from "Meeting the Special Needs of Low-Birth-Weight and Premature Infants in the Hospital." Columbus, OH: Abbott Nutrition, Abbott Laboratories, Jan 1998, p 56. Water, Maltodextrin, Casein Hydrolysate. Less than 2% of: M. Alpina Oil, C. Cohnii Oil, Lutein, Beta-Carotene, Minerals (Calcium Phosphate, Potassium Citrate, Magnesium Chloride, Potassium Chloride, Potassium Phosphate, Salt, Zinc Sulfate, Ferrous Sulfate, Cupric Sulfate, Manganese Sulfate, Sodium Selenite), Medium-Chain Triglycerides, Soy Oil, Coconut Oil, Modified Corn Starch, Vitamins (Vitamin A Palmitate, Vitamin D3, d-Alpha-Tocopheryl Acetate, Phylloquinone, Thiamine Chloride Hydrochloride, Riboflavin, Pyridoxine Hydrochloride, Cyanocobalamin, Niacinamide, Folic Acid, Calcium Pantothenate, Biotin, Ascorbic Acid, m-Inositol, Choline Chloride), Distilled Monoglycerides, L-Tyrosine, L-Leucine, L-Tryptophan, L-Carnitine, Gellan Gum, and Potassium Hydroxide.